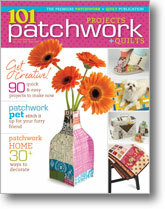 Sew Inspired: 101 Patchwork Projects + Quilts--get your own copy now! Congrats! The place mats look fun to try! Thank you for the give away! So fun! That came out quicker than I'd thought. I have the darling dishtowel you made me hanging in my kitchen now. 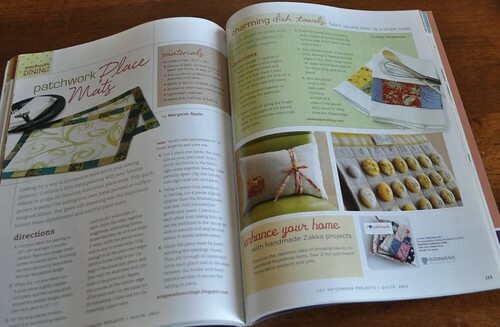 It must be so fun to see your cute projects in print! Congrats! I was at a store yesterday but couldn't remember it's name. Thanks for the cover picture, that will help me remember. Of course, a FREE one is even better. Congratulations!! I know that you're super excited!! I'd love to have this as an addition to my quilting "library." Thanks for the opportunity! I love your chicken potholder! Now I will have to get this magazine -- unless of course I win it! You must be over the moon! I sure would like a copy of that magazine! Looks like it has lots of projects to try. Such fun. I would love to have that book for inspiration! Oh Pick Me! This looks really cute. But I am not going to go buy it, cause I feel lucky! Congraulations! Thanks for the chance! 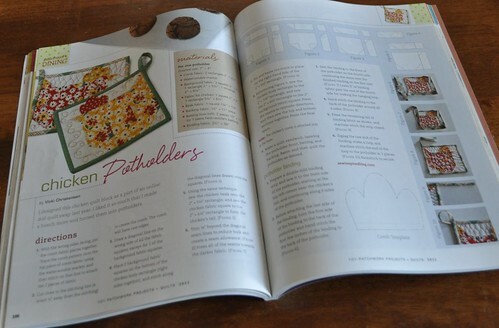 you can never have too many quilting magazines/books. thanx for the chance. Sure - I'd love to win it. And if I do, I want you to autograph it before you mail it to me. That would be so dang cool!!!! 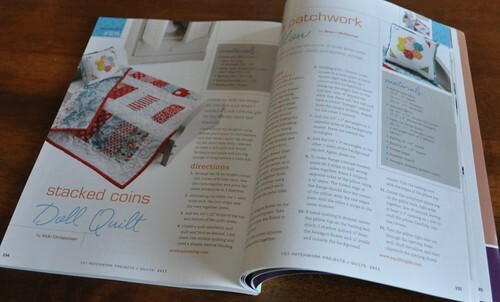 How awesome to have your quilts in featured in a magazine. Congrats! I am a lucky recipient of a pair of your chicken potholders and do they ever get praise! I want your readers to know how really cool they look in a kitchen. Congrats on the magazine! how fun... I would love to have that. I would love a copy of that!! Thank you for sharing...I'd love to get a copy of this magazine! Congrats! You really must be excited! Can't wait to get a copy. Thanks for letting us try to win one! I am loving that little doll quilt. I can't wait to get my hands on this magazine and check out all the projects! Love that hexie pillow! What a great book - 100 projects. 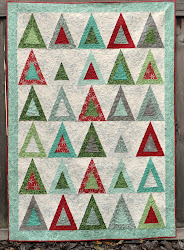 I would love to add this book to my collection as I am a beginning quilter and my collection is not very big yet! But, I would love to try some of these projects! This looks like a really fun book to have. It's very cool that you are 'in' the book. Thanks for a chance to win it! Congrats on getting published. Thanks for the chance! congratulations vickie! wow, 200 pages, sounds more like a book and tons of ideas! too fun!! congratulations - these magazines look so great - I've never picked one up! Thanks for the chance. Congradulations! I would love to win a copy but if not I may have to go out and get a copy anyways! Thank you for the giveaway. I had a chance to look through this magazine. I'd love to have one of my own! Oh, Oh, pick me, pick me!!! Surf's up!! Bring some sunblock! !See you soon!! I love that doll's quilt! Thanks for the opportunity to win! The magazine looks great! I'd love to get my hands on a copy. This looks like a fantastic magazine with lots of inspiring projects. Thanks for the chance to win a copy. How exciting for you to be published in such a wonderful magazine! Congrats. Seems like there are plenty of projects in there that i would love to try! would love to be the winner!! woo hoo! I would love to win a copy!!! Thanks for the opportunity. how exciting it must be to be in print!! Great job! Exciting! It looks like a great magazine. looks like a ton of great ideas!!!!!! How exciting to see yourself in print. Congratulations. Looks like some amazing designs in there! Thanks for the chance! Sounds like a great magazine. wow! i am going to have to look for this if i don't win! I saw one today at a quilt show and was 'inspired' by your creations! I'd love a copy of my own! That looks like a fun magazine! Oooh I'd love to win! Thanks for the chance! Congratulations. Looks like some wonderful projects in the magazine. Thanks for the chance to win a copy. As you can probably tell I am WAY behind in my emails but I thought I'd still enter just in case you havne't drawn a winner yet. I love what you have shown so far of this magazine. It's a must buy that's for sure. Me too - hope I'm not too late & that little generator likes last minute folk! Looks like a great magazine - congrats on your contributions.